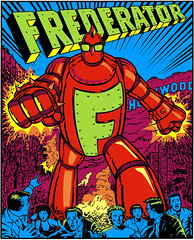 The Frederator Studios Blog: We're proud of our first movie. We’re happy to announce the showing of the first Frederator animated film: Globehunters: An Around the World in 80 Days Adventure. This picture was superbly directed by John Eng. (In a totally unbiased moment, I think it's the best looking animated film for television I've seen.) And we’re very proud and pleased that Nickelodeon is featuring it in their ‘Sunday Movie Toons’ slot. We hope you and your family enjoy the movie.